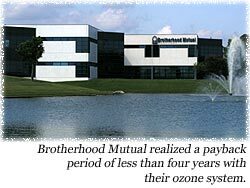 Brotherhood Mutual realized a payback period of less than four years with their ozone system. Brotherhood Mutual Insurance sought out CleanWater Ozone to provide a water treatment system which could assist their ailing 1000-gal., 150-ton cooling tower. Fouling problems due to high algae and bacteria content were reducing efficiency and corroding the tower ’s components. To reduce handling hazardous chemicals by their maintenance crew. To provide better algae and bacteria control. To reduce the future operating costs. The resulting design consisted of an ozone system to treat the circulating feed water. Daily tests showed the cooling water quality to be more stable than when using chemicals. The condenser vessels are cleaned annually and the condition of the copper tubes is reported as “excellent”. A cost analysis was completed after four years of operation and the system was found to have paid for itself midway through the fourth year. The system is about to complete its tenth year in operation. The building manager, Phil Doege, recently wrote us with the benefits achieved. Our maintenance crew handled 305 gal. of chemicals a year to treat our cooling tower and 1000 gal. sump tank. This potential problem has been eliminated. Ozone is regarded as one of the best bacterial & algaecide treatments available, but several contractors and suppliers we talked with had not come up with a system that was cost effective and worked well until we talked with CleanWater personnel. Their system is simple, cost effective and it works. Our cooling tower has been algae-free since installing the ozone water treatment system. What more could you ask for! . . .after [the system paid for itself] the cost of operating the system is electrical usage and maintenance. A 4th benefit for our company was reduced water consumption at bleed off to control our dissolved solids.